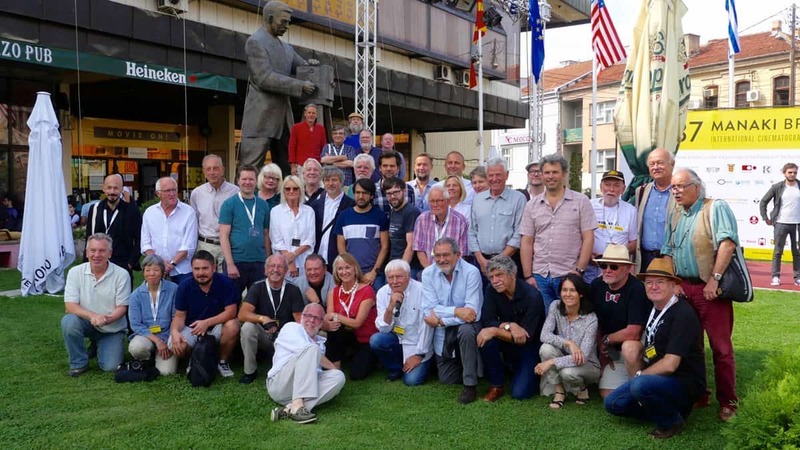 Say cheese… IMAGO Annual General Assembly delegates in Bitola, Macedonia. 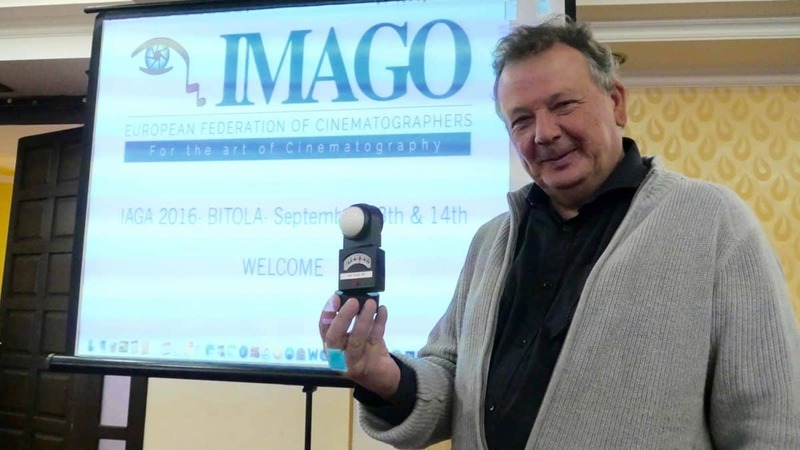 IMAGO had a successful Annual General Assembly in Bitola, Macedonia, arranged during the great Manaki Brothers Cinematographers Festival in mid-September. Forty-seven IMAGO delegates participated, representing international cinematographic societies from as far afield as Australia, New Zealand and Japan in the east, to Canada and Mexico in the west. The Macedonian Film Professionals Association was IMAGO’s host, making our stay both pleasant and our meetings effective. IMAGO’s great thanks go to Tomi Salkovski, Zoran Risteski, Dejan Dimeski, Snezana Stojanoska and Jovana Kalica, who looked after us all in such a perfect way. Also Blagoja Kunovski and Gena Teodosievska, the festival managers, for letting us experience this great Balkan film festival focussing specially on the cinematographer’s important role in film production. Macedonia, the city of Bitola, and the Manaki Film Festival is a place with a warm heart and a well-organised festival. IMAGO’s members will keep in mind and work to promote. Not long before the IMAGO General Assembly, we got the sad message that Frederic Goodich ASC had passed away. He was the International Liaison for the ASC, and worked continuously to increase good communication between our many national societies and across the borders. He was a true friend of IMAGO, and to many of us personally also a close friend. The loss was received with great sadness. All our thoughts and sympathy goes to Frederic´s wife Donna and son Nikolai. 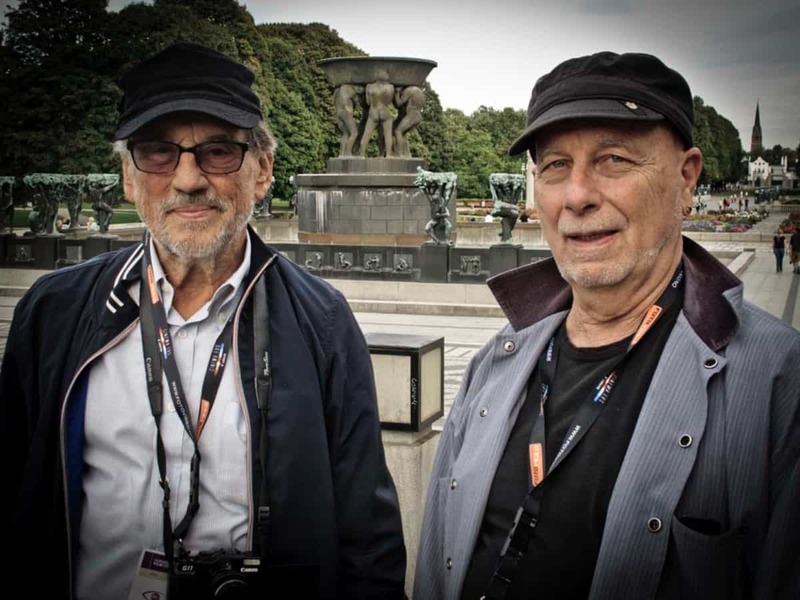 Fondly remembered… Frederic Goodich and Vilmos Zsigmond visiting the IMAGO/FNF Oslo Digital Cinema Conference in 2014. The Chilean and Malaysian societies of cinematographers were welcomed as new members of IMAGO during the General Assembly. IMAGO now has 50 international societies and more then 4,000 cinematographers as members from all over the World. The need and the opportunity to exchange knowledge and experience between international cinematographers and their societies have never been bigger. IMAGO is not a union, but information on the authorship situation around the world is useful and important for cinematographers. Many find the fact that stills photographers –when taking a photograph with the exact same motive, exposure and angle as a cinematographer – have full authorship rights, most peculiar, as the cinematographer does not when doing the same. The situation with authorship for our images varies greatly in between member countries. In many countries cinematographers have full authorship rights, in many they have not. IMAGO has therefore initiated a new Authorship Committee that will monitor the situation around the world, and will be working to spread information to our members about the worldwide facts and developments in this area. IMAGO’s Authorship Committee is chaired by Luciano Tovoli AIC ASC and is working with, amongst others, Nigel Walters BSC, and Jost Vacano BVK ASC and Vittorio Storaro AIC ASC as committee senior advisors. The establishment of a new IMAGO Committee for Gender and Diversity was unanimously agreed at IMAGO’s General Assembly. The committee is headed by Nina Kellgren BSC and IMAGO Vice President, and Elen Lotman ESC. It is time to look into how we can inspire more women, who represent 50% of our population, yet who only number only between 5 and 10% of international cinematographers, to become and staying working as cinematographers, whilst also looking closely into the mechanism that may be a hindrance to them. More female colleagues would be a great advantage for us all. In cooperation with Camerimage, IMAGO’s Gender and Diversity Committee will stage a whole day session with a masterclass and a conference on Friday November 18th, during Camerimage, where this challenge and possible obstacles for women cinematographers are looked into closer. Again, IMAGO is not a union, but the problematic working hours practised by many production companies around the world, strongly affect not only our personal and our family lives, but also the art of cinematography in a negative way. Ever since the death of assistant cameraman Brent Hershman, while driving home after a 19 hour long working day on a film set in 1997, and since Haskell Wexler made his famous documentary Who Needs Sleep (with his suggestion of 12 hours on and 12 off in 2006), we have regularly, almost weekly, debated this massive problem. In fact, reports come in about this problem greatly expanding around the world. The IMAGO General Assembly decided this is a problem that IMAGO should monitor and report about. In the coming year, IMAGO will stage a conference on Working Conditions in Brussels, where it will be decided how to proceed further with this matter. IMAGO will work to intensify its cooperation with Camerimage. This great festival celebrating cinematography was established in 1993, and the tremendous work that has been done by its director Marek Zydowicz, with good assistance from Kazik Suwala, and their team, has for both students of cinematography and for all international cinematographers been of invaluable importance. Along with the conference on Gender and Diversity IMAGO will, in cooperation with Camerimage and the ASC, be hosting a seminar on the importance of international cooperation between cinematographers and their societies, to find ways to secure a possibility for a better and easier update in the latest artistic and technical developments for our members and colleagues. In addition, IMAGO is working with Camerimage to spread information about this important festival to cinematographic societies and our many members worldwide. IMAGO is 25 years old in 2017. To honour the art of cinematography, the General Assembly voted unanimously to establish the IMAGO International Cinematographer’s Awards. This will be the first awards for cinematography given entirely by cinematographers, to cinematographers. The first Awards ceremony will be held in Helsinki October 28th 2017, and awards will be given for Best Cinematography in feature films, TV drama and documentary films. In addition, awards will be given for lifetime achievement and contribution to the art of Cinematography, along with an IMAGO award for technical excellence. ARRI has agreed to be the major sponsor for the IMAGO Awards Ceremony 2017, in cooperation with several other partners. The ceremony will be a high-profile, black tie event, with well-known hosts and presenters, entertainment, canapés and champagne. All our major partners will be invited in addition to representatives from the film industry around the World. The IMAGO Awards Ceremony will have broad media coverage by IMAGO’s many media partners, not least our main partner British Cinematographer Magazine, and through the Internet sites and newsletters of our more than 50 member societies, In addition, the ceremony will be streamed on the internet. IMAGO will need help from all our members societies to nominate films for the awards. Up to two feature films, one documentary film and one TV drama can be nominated from each member society. Our member societies will also be invited to vote for the lifetime achievement award. It will be chosen from three nominees in the main categories, by a broad international jury of cinematographers, and all the nominees will be invited to come and be celebrated by their colleagues during the awards ceremony in Helsinki, where the winner finally will be presented. The award for lifetime contribution to the art of cinematography will be voted for by the IMAGO Board, and the technical excellence award will be decided by the IMAGO Technical Committee. All IMAGO’s members and member societies will soon receive more information, and will be invited to help make this event a great international celebration of the art of cinematography. The IMAGO Board and General Assembly voted unanimously, and with great acclamation, to bestow Nigel Walters BSC with the IMAGO Honorary Member Award for his many years of intense and invaluable work for IMAGO, in the exchange of knowledge and experience between international cinematographers. Nigel is still one of IMAGO’s trusted major advisors and ambassadors, and is also a central member of the IMAGO Authorship Committee. 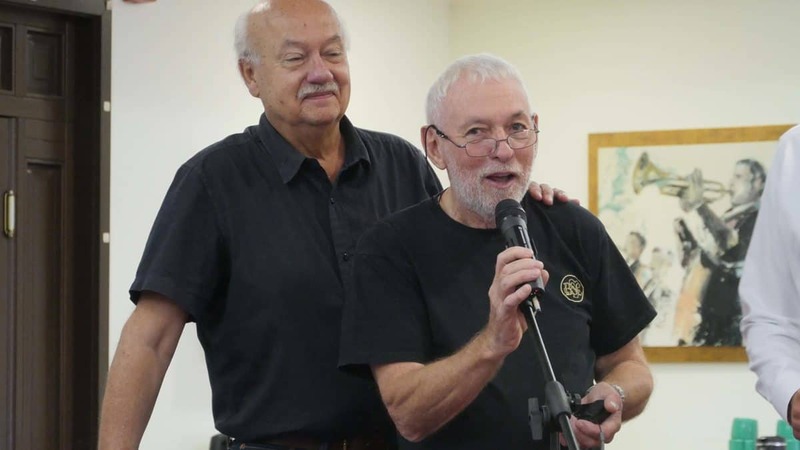 In addition, the IMAGO Board and General Assembly also bestowed the IMAGO Tribute Award to two of IMAGO’s most valuable and trusted “staff”, Kommer Kleijn SBC and Tony Costa AIP. Kommer has been heading IMAGO’s Technical Committee for more than a decade, and has been a hub for exchanging technical knowledge between international colleagues. Tony has earlier been IMAGO’s Vice President and has, for almost two decades, been working with excellence on the important issue of communication between IMAGO and its many members and partners. We congratulate both of them on their well-deserved tributes and awards.